Thailand and its delicious array of Thai dishes are rapidly growing worldwide recognition as being a true culinary treat for the gods. With exquisite delicate flavours and an emphasis on lightly prepared dishes with the perfect balance of the five fundamental taste senses, hot, sour, sweet, salty and bitter. 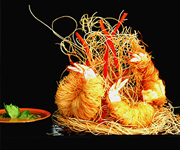 Thai dishes are mouthwateringly harmonious in presentation, taste and flavour. 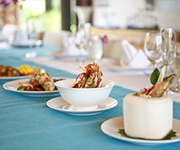 The Thai Culinary Experience is one of the foundations of The Signature service in the villas and we endeavor to share our passion for Thai food with our guests by bringing authentic Thai flavours to the table. 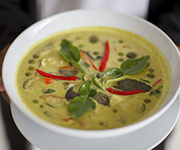 The Signature chef's offer delectable Thai dishes prepared using the freshest and highest quality ingredients, as well as healthy principles, low carbohydrates, low fat, low salt and no refined sugar. Our buffet offers a wide selection of dishes you can choose from and we suggest for everyone's enjoyment a balance of meat, fish and vegetarian dishes. Specific dietary requirements can be arranged either with certain dishes or for the entire buffet. Our team also proposes sit down Thai dinners, which are prepared together with the bridal couple, usually following their own selection of much loved dishes. We can help in recommending other favourite or sample dishes which would complement well the original selection or even be an ideal match with the wine served during the event.